The BBC had a monopoly on radio broadcasting in Britain, and pop music fans were poorly served by it. There was a limit to the amount of records they could play, and although groups came in and played sessions for Saturday Club and Easy Beat - about the only two pop shows on the radio - it still meant pop music received little exposure. But that changed when Radio Luxembourg began broadcasting, without any similar restrictions, and the world turned upside down with the advent of the pirate radio stations in 1964. Based in Luxembourg and broadcasting to the U.K, Radio Luxembourg was, in many ways, illegal. But based abroad there was no way to prosecute, much to the joy of teenagers who could tune in every evening and listen to a procession of records, interspersed with ads (making it the first commercial station heard in the country). English DJs flew in to work, making it seem local and friendly. It was so big that there was even a music magazine, Fabulous 208, brought out by the station. Offshore pirate radio didn't begin in 1964. It had started in Scandinavia in 1958, then was copied in Holland in 1961. Outside national waters it was completely legal to broadcast under a loophole in the laws. Radio Caroline took to the air in 1964, the brainchild of Ronan O'Reilly, who had been a record plugger. This, though, gave him opportunities on a much larger scale. It sold ads, and played 24 hour music, making it a revolution of sound for teenagers. It helped break several new artists, and gave airplay to many artists who'd never have been heard on the BBC. The disc jockeys, who'd spend a fortnight at a time on the vessel, became minor celebrities, feted by teens. But Radio Caroline, and those that followed, roused the ire of the government. There had been questions in Parliament, and the wheels began grinding slowly to rid the seas of the pirates. Where Radio Caroline caught the East and North, Radio London broadcast to the Southeast, anchored a few miles off Southend. 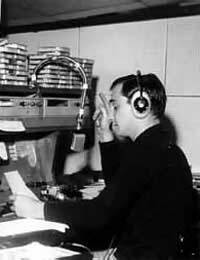 Bankrolled by a Texan, Don Pierson, it quickly attracted the name "Wonderful Radio London," making money for Pierson and serving music lovers. Radio City and Radio Invicta soon joined Radio London, whilst Radio Atlanta was just up the coast. Others joined them, old vessels fitted out with basic radio equipment and young disc jockeys who didn't mind braving the primitive conditions. For a while it looked as if the entire coast might be ringed with pirate stations, which had proved more popular with the young than the stodgy and out of date BBC Light Programme. It was too good to last. The simple fact was that it couldn't be allowed to last - it was draining too much of the BBC's audience, and the pirates were making too much money. It took until 1967, but finally the government passed a law that closed the loophole allowing the pirates to operate, and on August 15, the pirates were put out of business. Just a few weeks later, Radio 1 began, BBC's attempt to replace them, using talent that had operated on the open seas. The pirates had changed British broadcasting, opening the doors to more pop music, and forcing the BBC to finally consider the huge teen market for music. And may it always stay that way, Dan. Radio needs fresh voices who can bring things besides charm. There’s plenty of great music out there that’s never (or rarely heard) on commercial radio (including the BBC in that). People with open ears and experience in broadcasting can add plenty to radio, as long as they’re given the chance. But the truth is that pirate stations still continue, even in these days of the Internet. People broadcast because they can, playing music they feel people should hear. Yes, it's illegal, and generally the transmitters are so weak that only a few can hear, but the spirit of resistance remains, especially in big cities like London, and some of the DJs have gone on to bigger things, bringing new blood and new music to the establishment.